I pick up a random pencil, in this case, from a box containing around two thousand of pencils—a giant mishmash of old and new pencils. I want to write something. Or maybe not even. Maybe I just want to have a pencil in my hand, in case want to write something. In case I get an idea, or I think of a To Do and need to jot it down. Simple enough. So I reach into the box and grab a pencil. What’s this? Blue? Is it a drafting pencil? No. Hmmm… I wonder, who was Robert Clapp? I’ll have to look him up sometime. Whoa, could I write a little documentary essay about tracking him down? A mini-biography of a non-famous person? A pencil blogger’s take on Human Being, by Christopher Morley! Obscurities piled on obscurities. 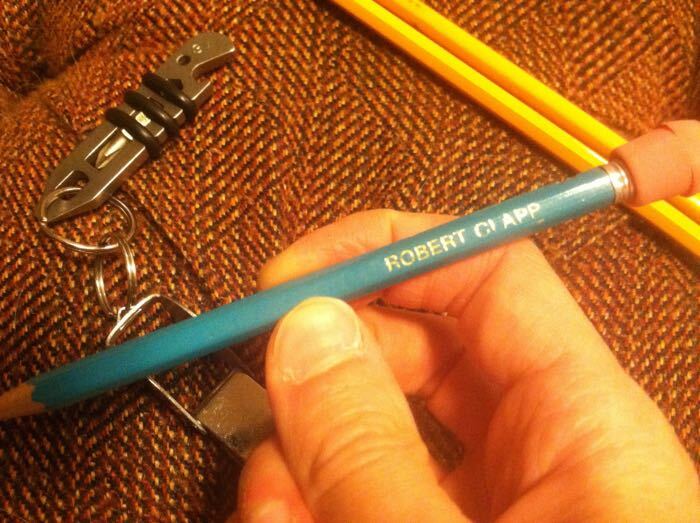 Imagine if I could give this pencil back to Robert Clapp. 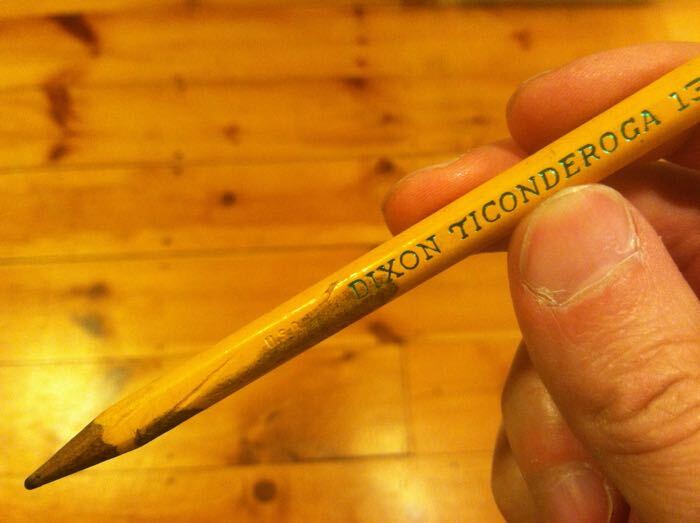 Maybe he had these pencils made thirty years ago and this is the only one left! I could write a story about that. Oh well, can’t use that one. Then I notice areas where the finish has been rubbed off the pencil, exposing the wood underneath. How did that happen? 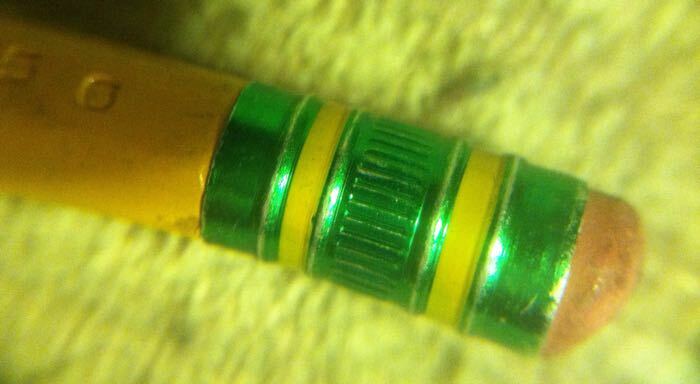 I don’t think I’ve ever seen another pencil in this condition. I need to study this matter further, and to post my findings. Then I look at the ferrule. Hmmm… I wonder what the little ridges are for. Holding the ferrule with my thumb and forefinger, it hits me: they’re for better gripping when you’re erasing. You pencil designers thought of everything! I wonder who came up with this. Would it be possible to find out? Maybe I’ll write an article about the evolution of the ferrule. Or maybe I’ll just collect some fun facts about the ferrule. Well, I’ll have to set this pencil aside to remind me of all these ideas. So I grab another one. Oh good, It’s a STAPLES 2 HB. Totally unremarkable. Boring! So boring I don’t even want to use it. Sigh. Then I remember the Staples 2 HB is the type of pencil reported on in the “Pencil Sightings – Kohl’s.” So this is a special pencil after all. Better pick a different one. This could go on all day. One pencil after another. It seems I can’t use a pencil if I can potentially write about it. And I could write about each and every one, so it turns out I can’t use any of my pencils.